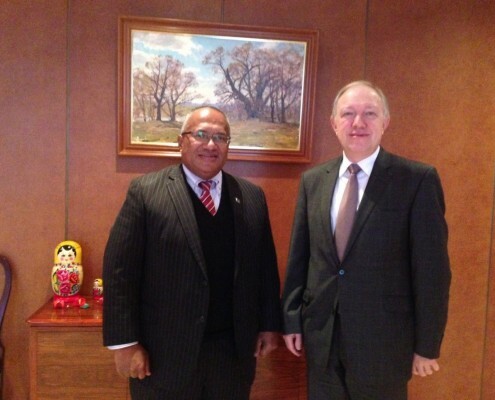 On Tuesday 9th December 2014, HE Ambassador Isikeli Mataitoga had a meeting with Mr Andrey Tatarinov, Director of the Third Department of Asia & Oceania, MOFA Moscow at the Embassy of the Russian Federation in Tokyo. The Ambassador was accompanied by SS Kelera Savu. Ambassador Mataitoga informed of the supportive remarks received from FET participant, Counsellor Korovou in regards to the latest “Foreign Policy of the Russian Federation in a Globalized World” which was held at the Diplomatic Academy of the Russian Federation last month, November 2014. He also noted that Fiji is one of the seven PICs Embassies in Japan. Mr Tatarinov provided updates on the Deputy Minister of Foreign Affairs of the Russian Federation, Mr Igor Morgulov, proposed visit Fiji in late January 2015, underscoring the importance of this visit in Fiji/Russia bilateral relations. Both noted that such high level exchanges are productive in ensuring that our bilateral relations are deepened and to explore new areas of cooperation. Ambassador Mataitoga observed that apart from the actual meetings between the Deputy Minister Morgulov and Permanent Secretary Amena Yauvoli, several short courtesy calls would be also be arranged. He also added that this is an excellent time to visit Fiji, and that Indian PM Narendra Modi and Chinese President, Xi Jinping has obviously provided a positive significance of such visits to the people of Fiji, India and China. On the regional organizations, the Ambassador stressed that Fiji position is that we will not be re-joining the PIFS, unless there is a major reform of that organization. Fiji considers that PIFS is dysfunctional and no longer meets the original expectations of all its members. It now serves the interest of only a few members. Other organizations such as SPC and PIDF are the primary ones that Fiji will focus on in the future. Continuing support by the Russian Federation for PIDF is important. Ambassador Mataitoga observed that Ambassador Morozov is proposing a visit of Speaker of Parliament of Fiji, the Honorable Dr Jiko Luveni to Moscow in April 2015, and thanked Mr Tatarinov for the Ministry`s hard work in the needed facilitation to be undertaken for a very positive visit. This is part of an effort to establish closer cooperation between the Russian Federation Federal State Council and State Duma and the Fijian Parliament. Mr Tatarinov also conveyed the warm greetings of the Deputy Minister Morgulov. He also highlighted his commitment and that of his country to work on strengthening bilateral and international relations with not only Fiji, but the rest of the Pacific Island Countries as well. 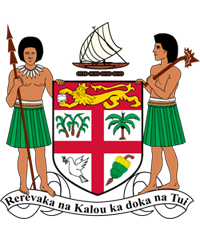 Russia considers Fiji as a partner and friend, and that seeks the assistance of Fiji to also advice on how they can better handle the Pacific Islands, further noting that Russia today wants to be part of the Asia-Pacific and have more part in the Pacific Island Countries. The Ambassador also noted from the exchanges prevailing opportunities and prospects that would further strengthen ties between Fiji and Russia. The Ambassador and the Director Tatarinov looks forward in working together in developing the two country’s relations to new heights.